How Many Calories Should I Have if I'm Trying to Lose Weight? Jennifer Schaeffer began writing in 2005, with work appearing in various online publications. She is an American College of Sports Medicine-certified personal trainer, a Crossfit Level 1 coach and a certified Olympic weightlifting coach. Schaeffer holds a Bachelor of Arts in English literature and language from Stevenson University in Greenspring, Md. Weight loss is all about calories in, calories out, but beware of low-calorie diets that claim to give you extreme results fast. Diets that women consume fewer than 1,200 calories and men no more than 1,500 calories may ultimately do more harm than good. Though you will initially lose weight, this diet cannot be maintained for a long period, and when you resume normal eating, the weight comes back. This begins a cycle of yo-yo dieting. Instead, healthfully decrease your calories daily to promote moderate, sustained and permanent weight loss. Your daily caloric needs are based on your age, height, gender, current weight and activity level. Without knowing how many calories your body needs to maintain you at your current weight, you have no idea where to cut out or decrease calories. Many online resources are available to help you determine how many calories you should eat daily. The American Heart Association provides a general caloric expenditure chart based on gender, age and three tiers of activity level. For instance, the Heart Association says a sedentary women between 19 and 30 needs 2,000 calories a day. If you are looking for a more specific number, try the calorie calculator provided by Ask the Dietitian. This calculator bases your caloric needs on your age, height, current weight and five tiers of activity level, and the website provides options to input your current body fat, calorie distributions between carbohydrates, protein and fat, waist-to-hip ratio and your weight-loss goals. Not everything you eat is going to come with a nutrition label pasted to side of it, but you still need to account for these calories. 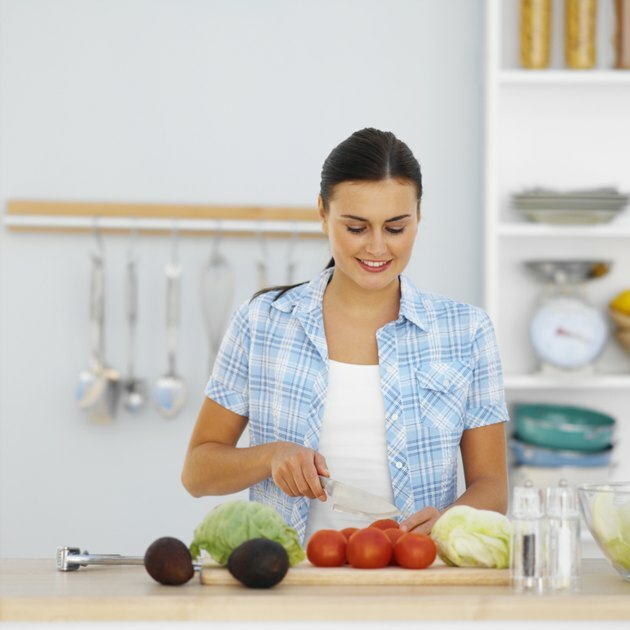 A registered dietitian can help you determine the caloric values of foods such as fresh fruits and vegetables that do not come with nutritional value charts as well as the meals you eat out at a restaurant. Use a small notebook to help you keep track of how many calories you eat throughout the day. Write down everything you eat, including the caloric amount, even if you feel guilty for eating it. Committing yourself to track your diet keeps you responsible and accountable for your food choices. Healthy weight loss is no more than 2 pounds per week. This kind of moderate weight loss is more likely to stay off versus extreme weight loss. Creating a 500- to 1,000-calorie deficit daily will help you lose 1 to 2 pounds per week. If you have trouble trying to reach this caloric deficit, add exercise. Exercising not only burns calories but also builds lean muscle. Lean muscle burns more calories than fat throughout the day. So as you increase your lean mass, you will burn more calories than someone with a higher body fat percentage.